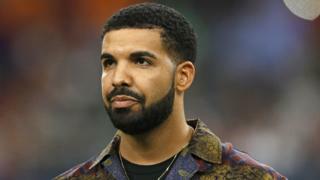 Drake has described the end of his long-running feud with Meek Mill as "one of most electric and gratifying moments of my career." After years of trading insults online and through their music the two rappers appeared together on stage in Boston. Drake added: "I'm happy that you are home and that we could find our way back to our joint purpose." The pair have been feuding since 2015 when Meek Mill accused Drake of not writing his own lyrics. Drake is currently midway through his Aubrey & The Three Migos Live tour. The Canadian star surprised fans at the TD Garden in Boston by bringing out Meek Mill to perform the song Dreams and Nightmares (Intro). The track appears on Meek Mills debut album of the same name released in 2012. Drake shared a picture of the two men on stage where part of the caption read, "This really gave me peace of mind tonight." Their decision to end their feud was applauded by celebrities including comedian Kevin Hart who wrote "#GrownMen" in the comments section of Drake's post. Drake and Meek Mill's initial fallout was a surprise to many music fans. The two rappers have regularly appeared on songs together and seemed to also have a good relationship outside of music. However a tweet from Meek Mill in July 2015 - that's since been deleted - highlighted chinks in their friendship. Meek accused Drake of one of the cardinal sins of being a rapper, getting someone else to pen your lyrics. The tweet read: "Stop comparing drake to me too. He don't write his own raps! That's why he ain't tweet my album because we found out!" He continuously taunted Drake and in an interview with 1Xtra DJ Charlie Sloth, at Hot 97's Summer Jam concert in June 2015, Meek Mill expressed his disgust at rappers who don't write their own material. What followed was a war of words, threats and diss tracks which included more accusations and denials between the pair. Drake and Meek Mill's beef was made all the more interesting as at the time Meek was dating Nicki Minaj - who just happened to be a very close friend of Drake's and signed to the same label. The two men appearing on stage is the first public showing that they've put their differences aside. However earlier this year Drake gave another indication that they were on good terms when he appeared on stage wearing a "Free Meek Mill" T-shirt. Meek Mill was sentenced to up to four years in jail for breaking the rules of his probation following a drug dealing and weapon trial dating back to 2008. After an appeal he was released after serving five months of that sentence. Meek Mill had other high profile supporters including Jay-Z, comedian Kevin Hart and billionaire businessman Michael Rubin. Although the American could potentially still face more jail time as he's currently involved in a long running dispute with prosecutors in Philadelphia.